Sekiu Salmon winter fishing charters available now. Our winter Sekiu Salmon fishing starts February 16 and ends April 10, 2015. This is an excellent winter Chinook Salmon fishing opportunity. Excel Fishing Charters will be offering fishing charters for this 2015 winter season. Sekiu has some of the best Blackmouth fishing in the entire Puget Sound and Strait of Juan de Fuca. This season, the limit for this fishery has been increased to two Chinook salmon per person! Only hatchery fish can be retained. 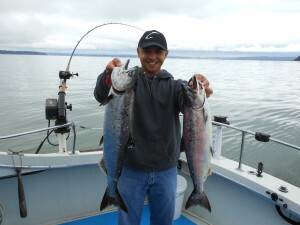 Take advantage of our off-season policy of not mixing parties on Sekiu Salmon fishing charters at Sekiu, Washington. You can have the entire boat with as few as two fishermen. The cost is $160 per person and we depart from Neah Bay. It is just a short 40 minute boat ride to the fishing grounds in Sekiu. Give us a call at 360-374-2225 to book your trip. Also, ask about our accomodations, The Inn at Neah Bay for your lodging needs during your stay and save 20% on your lodging. We look forward to seeing you on a Sekiu Salmon Blackmouth charter this winter and spring!